Super excited to get build 0.14.0 out on Steam! And it’s a big one too with the new weapons mechanic and several important UI optimizations that should increase FPS on slower machines. Adding weapons to the game has been on my mind for at least three months now and it’s finally here! 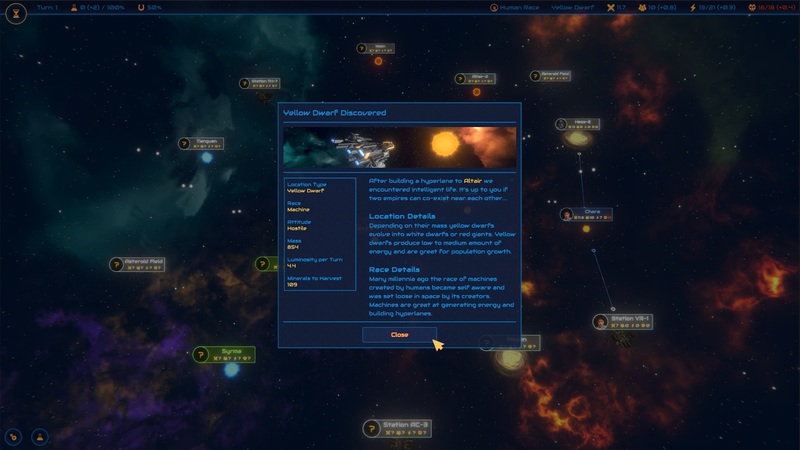 This mechanic adds another dimension to the game by introducing special actions themed as “weapons” that allow the player to influence other stars and stations without having direct access to them through hyperlanes and wormholes. To start using weapons you have to build a Weapon Lab that unlocks weapons near a specific star. Each weapon has a range and an energy cost, which depend on the type of weapon and the amount of affected resources. To increase the range and decrease the energy cost players can upgrade their weapon labs. The current version of the game includes five different weapons. Let’s take a look at all of them! This weapon destroys population around another location or, if that location has the shield enabled, it reduces the shield. It’s super useful in situations when you are low on population and are about to get attacked or when another one of your locations needs help attacking but can’t quite win the battle during this turn. Mineral Teleporter introduces a wide array of new strategies where the player can focus just on collecting energy and not harvesting minerals from asteroid fields. This weapon permanently reduces base combat strength at a given location. This is a powerful support weapon that can be used to effectively take over a location. Just remember that this effect lasts for the entirety of the game, so once the location is yours it will remain vulnerable unless you complete research that increases combat strength across all of your locations. This weapon permanently reduces base energy collection rate. It can be used in multiple scenarios when the attacking player needs to handicap enemy’s energy production. This is perhaps the most fun weapon in the game! It literally forces any star to go supernova even if the star can’t naturally do it. Since this is such a destructive weapon that throws a whole star neighborhood into disarray the cost of it is pretty high and depends on the mass of the target star. Build 0.13.0 is out on Steam! I managed to add several important quality-of-life fixes as well as a couple of major gameplay changes to it. Let’s dive right in! 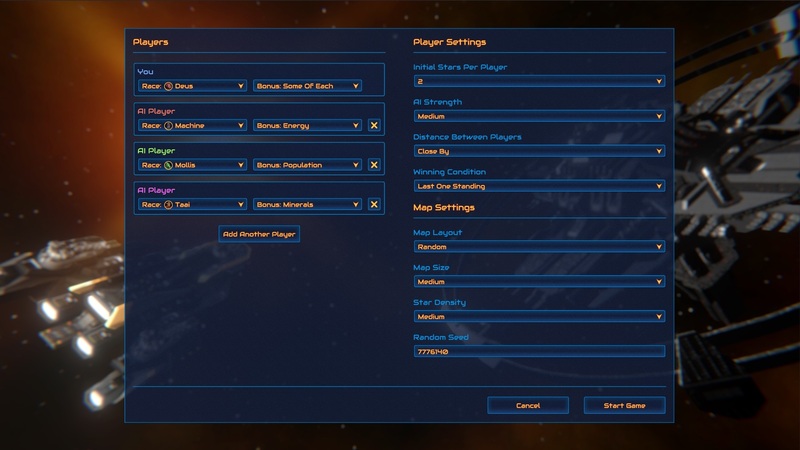 I reorganized the custom game screen where you can now add and remove AI players and customize their races and initial bonuses (more on that later). I also removed several settings that weren’t used by anyone. Another new feature that was added to this screen is the random seed that the game engine uses to generate the map. It gets reset every game but you can now change it to whatever you want. For example, if you liked a specific map setup then you can set the same seed for your next game and essentially play the same game but may be try different strategies and initial conditions. I added the 5th race—called deus—to the roster. Deus represent enhanced beings that branched off from humans many millennia ago. They live and breath technology and science, so every location occupied by deus increases your research speed and research points. Since there’re five races now I decided to add two combat bonuses per race against two other races. Combat bonuses work the same way Rock, Paper, Scissors, Lizard, Spock outcomes work. Let’s see if this system creates more interesting and fun battles. Many beta testers felt frustrated with negative effects of races and research that come hand in hand with bonuses. I understand the frustration, so I decided to try a version of research and races without any negative effects. Let’s see if that works! Any game now begins with an initial bonus that can be set in the settings. 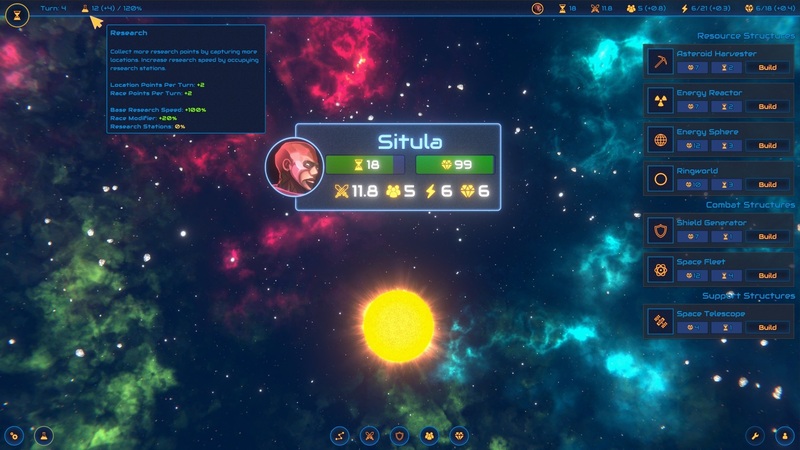 Currently there are only four different bonuses: extra population, minerals, energy, or a little bit of everything. 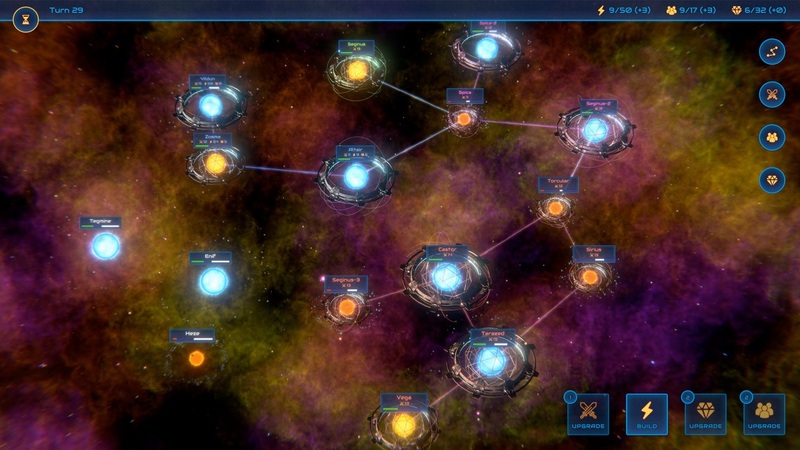 Depending on the bonus and the initial race combination, early game becomes very exciting and every time players face a different puzzle of how to approach growing their economy. Finally, I added a change to how research points are collected. Before, they were based on the number of locations. I changed it, so research points are just another property that can be increased through various means (on top of the number of occupied locations). For now, this property was added to the new deus race but I expect it to be added to structures and research in the future. Last update introduced population races and this update brings this mechanic a few steps further. 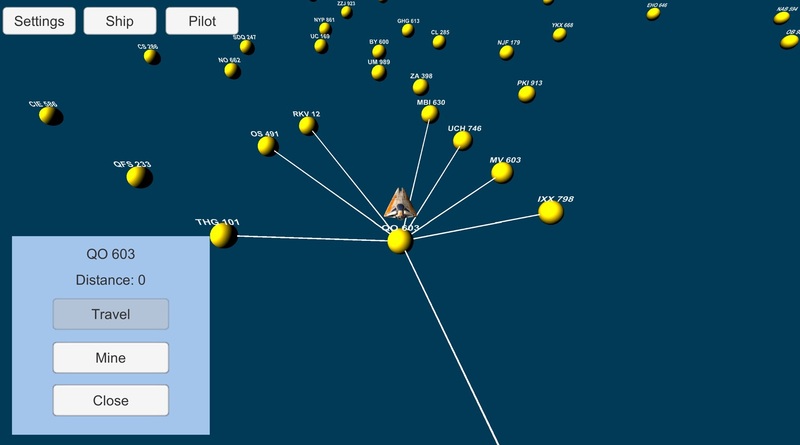 Now, after the player captures a location, the population race stays the same. In order to change the race at a given location, you’ll have to go to the population manager (which is another new feature) and manually convert it to a new race. This process comes at a cost: some amount of energy is required during the conversion and you only end up with 70% of the original population at the end. Players don’t have access to all races at the beginning of the game—you’ll have to discover them by capturing locations with different races. If two locations have different races then you can’t transfer population as easily between those two locations. Every such transfer comes with a 50% population cut. For example, if you want to transfer 10 population to a location with a different race, the target location will only receive 5 population. Finally, I added another race called Mollis. Mollises are great at harvesting minerals but all of their construction takes extra time. They also have a combat bonus against humans. With this addition the game is at four races that force the player to use different strategies during the game. The plan is to add two more races in the coming months. With new mechanics being added, game AI quality has been deteriorating, so it needed an overhaul. The game is at the early stage of AI 2.0, if you will, but it already comes with some real improvements. One of the bigger changes has to do with AI being aware of the supernovae. 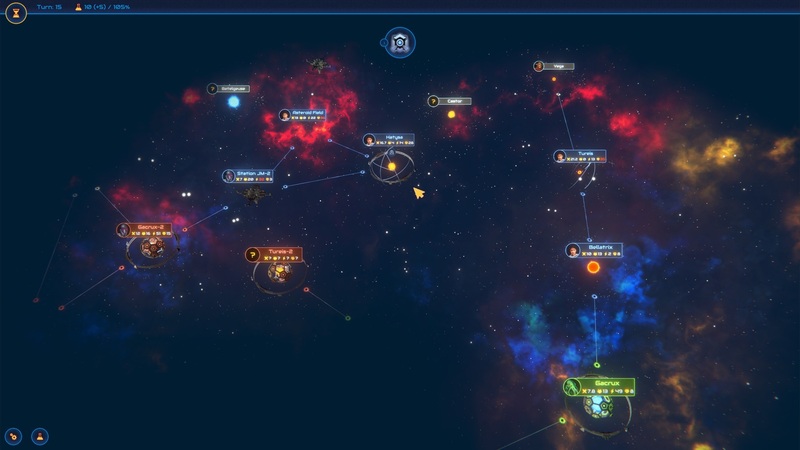 Gone are the battles when an AI player would transfer population to a blue giant a couple of turns away from exploding. AI has gotten a lot better at transferring minerals. There’s still a lot to tune but now all locations that are in dire need of minerals have a better chance of receiving them from neighbors. This is particularly important for space stations that can’t generate minerals. [UI] I added a new popup over the turn count that shows what the goal of the current game is. [GRAPHICS] I tuned some post-processing and brightness effects for a better look. [GAMEPLAY] Rate effects during random events are more severe now. [MUSIC] I added four more beautiful tracks to the soundtrack. Build 0.11.0 is out on Steam! This update introduces races and several other more minor improvements. Let’s dive right in! Races is a brand new game mechanic in the world of Eons of War. Now every occupied location in the game has a race of sapient beings. At the beginning of each game, initial locations are populated by the race set in the game settings. As the game progresses, locations become inhabited during colonization. Each race has a set of traits that directly affect construction, resource production, and research. Also, each race has a combat strength bonus against some other race. This adds another strategic layer to gameplay. 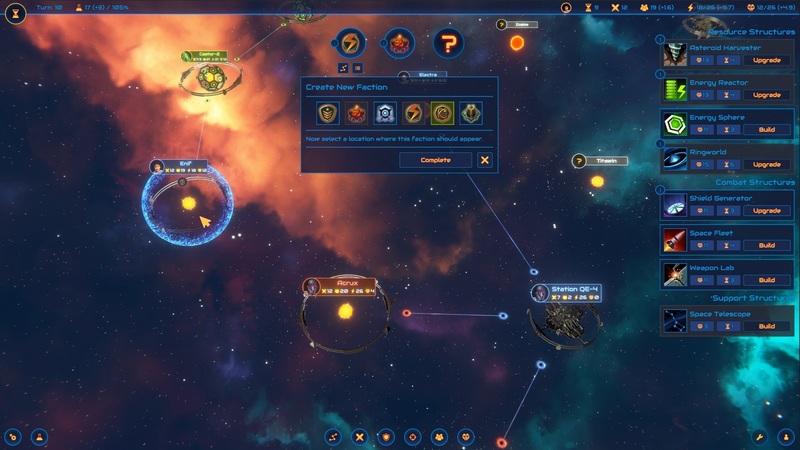 If the player wins an attack against another location with a different race they will be presented with an option to assimilate attacking population, which effectively keeps the newly conquered location’s race the same. It comes at a price of a one time population reduction but it could be very beneficial if the player is looking to add more races to their empire. The initial version of this mechanic includes three races (more are coming in future builds): humans, machines, and baloghs. Humans get to build structures on the cheap but their population doesn’t grow as fast. Machines collect extra energy at the expense of the minerals. And baloghs are trueborn warriors with increased combat strength but reduced research speed. [GAMEPLAY] Negative resource rates are now allowed. [GAMEPLAY] Structures were changed to have the maximum level of 3 instead of 5. [UI] Location panels are now highlighted with color of the player occupying them. Also, we cleaned them up to show less content by default. Hover over your locations with a cursor to see more details. [UI] Structures are now organized by category and name. [UI] Action properties now have tooltips explaining all bonuses and handicaps. [BUGFIX] Fog of war now renders correctly on all OpenGL setups. Protostar about to turn into a yellow dwarf. I built Eons of War around the idea of every turn taking a very long stretch of time—an eon. Over many turns stars’ luminosity goes up and they loose more and more mass until they either collapse or go supernova. 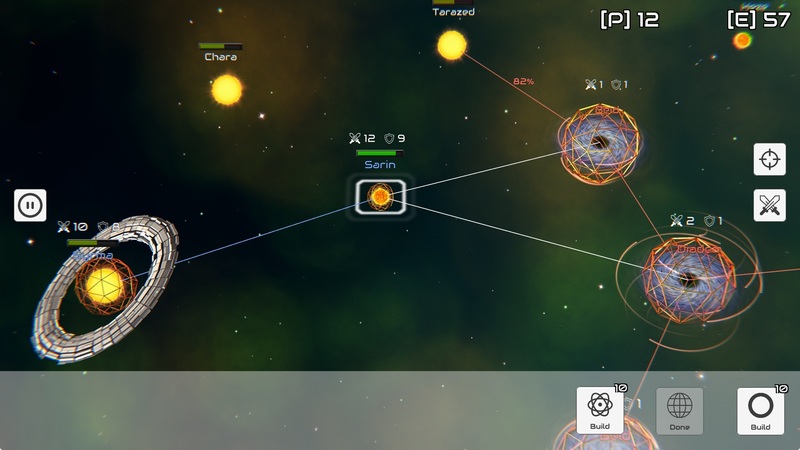 This update introduces star phases that match real-world stellar evolution. New stars start out as contracting disks of gas—or protostars. Depending on the initial mass, protostars evolve into red or yellow dwarfs. Red dwarfs are small and cool stars that can sometimes exist for trillions of years. In the game they are one of the final star phases and never collapse or go supernova. Yellow dwarfs are stars like our Sun that evolve into red giants, which, depending on their mass, collapse into white dwarfs or evolve into blue giants. 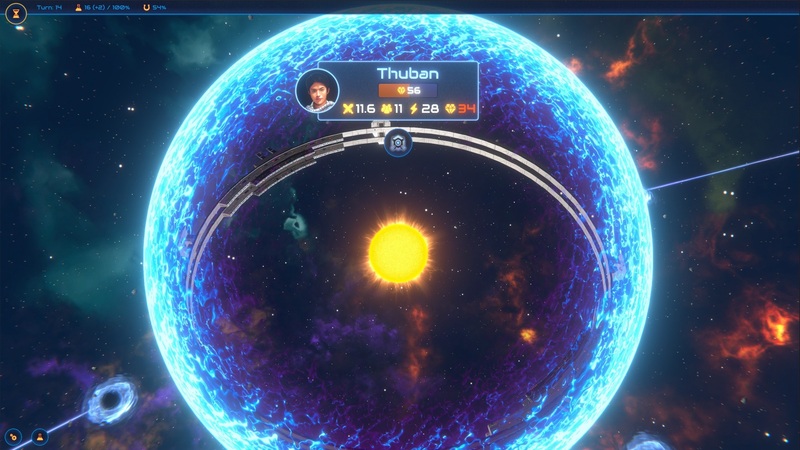 Red and blue giants are very bright active stars, so it’s easy to extract lot of energy from them with energy spheres. The downside of the giants is lower base population growth rate and more expensive construction. 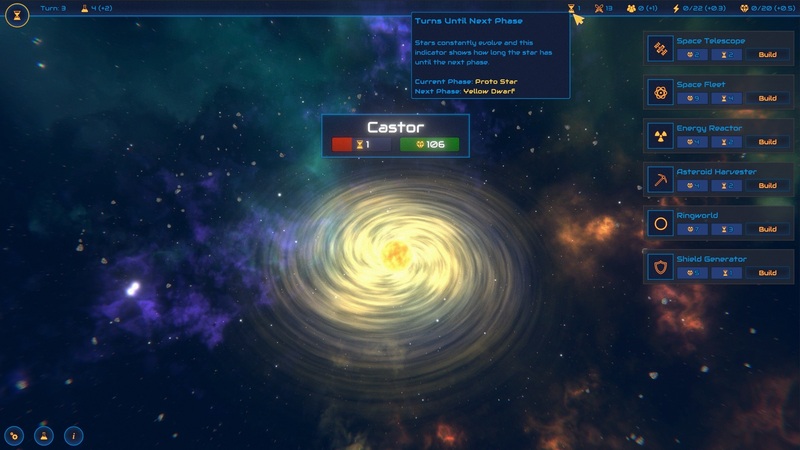 All dwarf stars have a high base population rate and low construction costs. Finally, blue giants are the only stars that go supernova that later collapse into black holes. 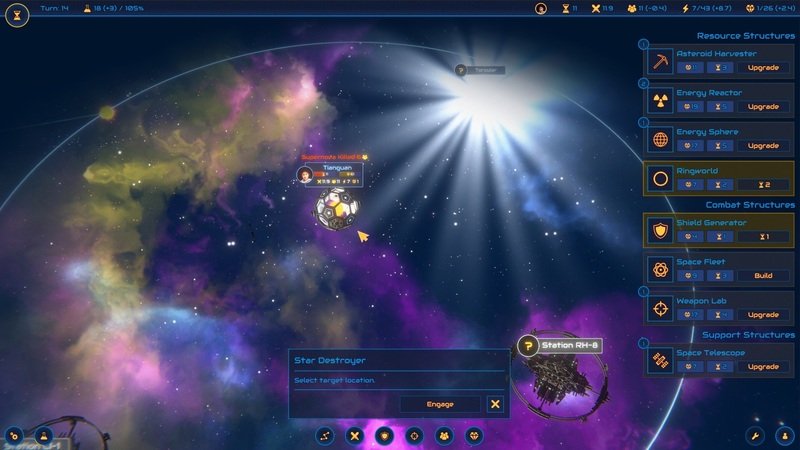 Supernova “resets” minerals in the asteroid field, so black holes become very desirable locations in the late game with a high base population rate and cheap construction. 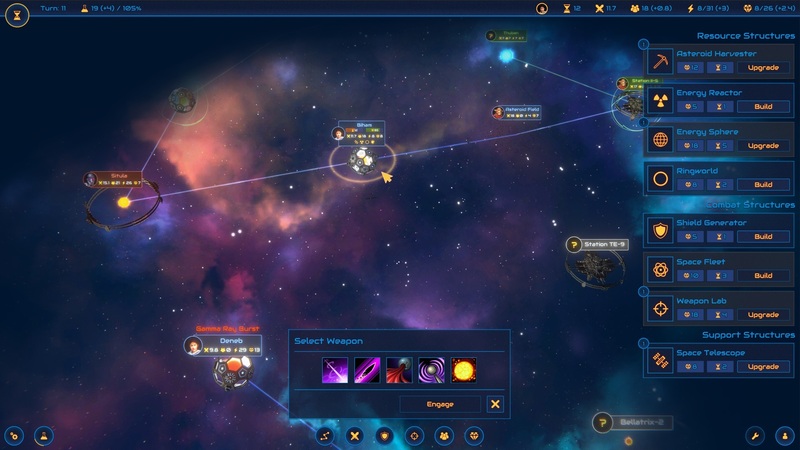 Black holes can also be used as wormholes and completely change how the endgame is played. Wormholes in Eons of War represent an invisible network between black holes. 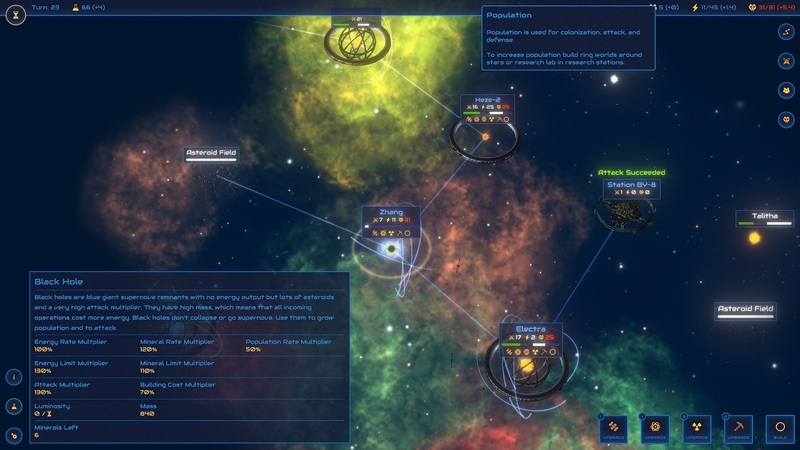 This mechanic introduces another way to attack and transport population and minerals between locations. Wormholes behave just like hyperlanes, except there is no distance or mass energy cost when you use them to perform an action. If you occupy at least one black hole all other black holes become visible on the map. To start using a black hole as a wormhole you have to build a wormhole portal that allows you to initiate actions to other black holes. As the time goes by, more stars collapse into black holes, which leaves the back of your empire more vulnerable. 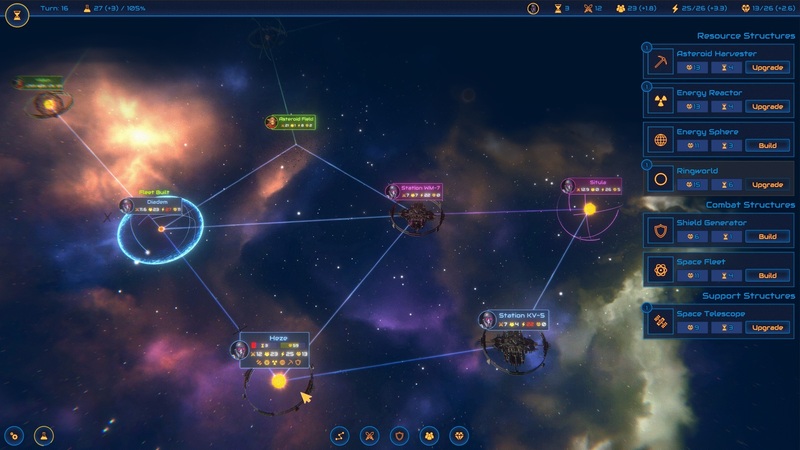 Suddenly, you have to not only worry about hyperlanes but also about wormholes. This is an exciting dynamic that adds spice in the endgame. [GAMEPLAY] Renamed hyperspace tunnels to hyperlanes. [GAMEPLAY] Now initial minerals don’t depend on the star type. [GAMEPLAY] Construction mineral cost is now inversely proportional to luminosity. 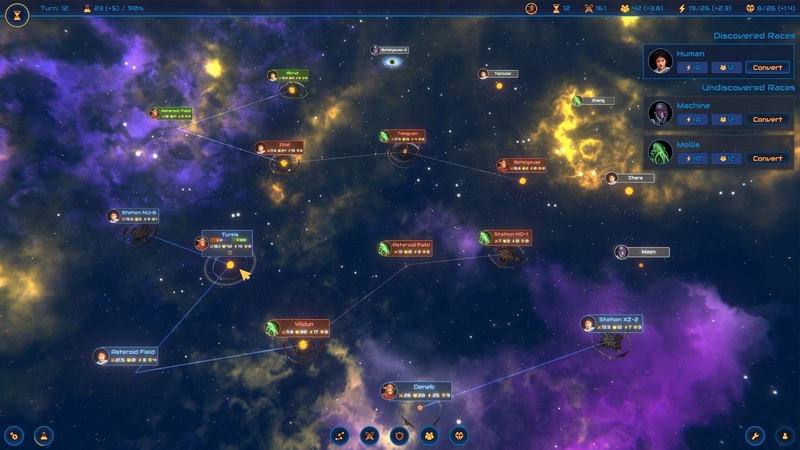 [GAMEPLAY] Base population rate is now inversely proportional to luminosity. [GAMEPLAY] Updated action cost modifiers to be incremental instead of percentage-based. [UI] Added a turn countdown to the resources bar with a tooltip containing information about the current phase and the next phase of the stellar lifecycle. [UI] Added more information to the minerals tooltip about the total amount of minerals left to harvest.